Never mind what Homer Simpson thinks; democracy works! And for once, it worked in the ravers' favor. The Miami City Commission voted yesterday to approve Ultra Music Festival's second weekend of programming, striking down a resolution submitted by Commissioner Marc Sarnoff that could potentially have shut down the festival's March 22-24 programming. Miami New Times reports that Commissioners Frank Carollo, Francis Suarez, and Michelle Spence-Jones all voted in favor of Ultra's six-day run, with the only caveats being that the festival's organizers must pay $500,000 into a special City of Miami police fund — presumably on top of the $600,000 they have already budgeted for hiring off-duty police and fire personnel to provide security — and that they must approve the approval of the City Commission, and not just the previous approval of Bayfront Park Trust, before announcing 2014's dates or selling tickets. 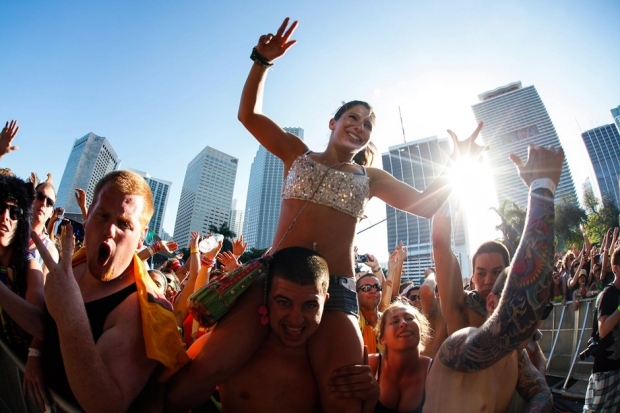 It was Sarnoff's contention that this year Ultra's organizers had attempted to force the Commission's hand by putting tickets on sale before city approval had been given. According to Miami New Times, even Sarnoff came around to Ultra's side. In the end, he set aside his concerns about festival-goers "urinating, defecating, or throwing up" on city streets, noting only that he prefers his hedonism contained. "We all know drug usage is high at Ultra. And it might be okay for a young man to get high, or whatever you want to call it, on Friday, Saturday, Sunday. But you are going to have some people try to do Friday, Saturday, Sunday, Monday, Tuesday, Wednesday, Thursday…"
Is this the new face of compassionate conservatism? Perhaps the man that 2 Live Crew's Luther Campbell called "the worst politician in Florida" is trying to mend fences with the musical community. His suggestion that ravers ought to keep their drug use to a reasonable three-day bender sounds surprisingly like a bit of folk wisdom long championed by Richie Hawtin: "Just because you like chocolate cake doesn't mean you eat it every day." Perhaps, in a nod to community outreach, Sarnoff ought to post signs around his district bearing Ewan Pearson's famous motto, as immortalized in the Berlin party documentary Feiern: "Don't forget to go home."